With the Gear Fit 2, Samsung made hefty changes to its wearable line both inside and out, and the result is an Android and iOS-friendly device that does a whole lot for your money. The first Samsung Gear Fit was a fitness tracker through and through, but with a hint of smartwatch for good measure. Since its release in 2014 (about half a century in tech years) many similar options have jumped into the fray, starting with the Microsoft Band 2 and Fitbit Blaze and more recently the Polar A370, Gamin Vivofit 4. But, in being one of the first to hit the scene, the original Gear Fit actually got a lot right. The Super AMOLED display was gorgeous, and its balance of fitness and smart functions helped to set a standard for devices to come down the line. But for all that it accomplished, we were left wanting a little more substance. After all, when you promise smart features, you raise expectations and sometimes, that brings unfair comparisons to products out of its league. The Samsung Gear Fit 2 arrived after a two year break since it gave us the Gear Fit and while it might look like not whole lot has changed, Samsung has clearly learned from the last go-around. There are improvements at nearly every turn, and it all comes together as even better value in the process. there's now the Samsung Gear Fit 2 Pro. Surprisingly, it doesn't offer all that much in the way of new features that would leave current Gear Fit 2 owners wanting. The Gear Fit 2 launched at $179 (£179, about AU$300) but you may be able to find it for a little bit cheaper now. We've seen the Gear Fit 2 go as low as $129/£150 which is a great price for this device. Samsung hasn't seen fit to release the Gear Fit 2 in Australia and you probably shouldn't expect it to ever reach there either, it's now over two years old. If you do, you might find the original Fit 2 to be the better of the two options. That is, if full waterproofing and offline Spotify support don't speak to you personally. Paramount to the Fit's design ID is the curved touchscreen. Don't worry, it didn't go anywhere. It's back with the Gear Fit 2, vibrant (and shiny) as ever, although slightly reshaped. This rectangular display is now wider than before, offering more screen real estate for fitting in additional information. That means extra words in a notification, a more robust media player, and a full map of your run provided by the built-in GPS function, to name a few use cases that take advantage of it best. The Super AMOLED touch-sensitive display found here is a bit smaller than before (1.5-inches down from 1.84-inches), but it boosts the pixel density up to 322ppi, which trounces the original's 245ppi display. The bezel surrounding the display has also seen a reworking to its benefit. It's been reduced, giving the Gear Fit 2 a more edge-to-edge look. Unfortunately, this move cuts out the shiny visual elements of the original Gear Fit, if that was your thing. In 2014, companies were only beginning to figure out how to make wearables less bulky, something that you'd actually want to wear in public. The Gear Fit was a step in the right direction, but still a way off. The Gear Fit 2 keeps the general aesthetic of the original (a good thing) and makes it better by mixing up old and new ingredients, to make it easier to use and more capable, to boot. The curved, rectangular screen is surrounded by frosted metal trim in the color of your choosing and backed with sweat and water resistant plastic where it touches your wrist. You'll find two buttons on the side of the Gear Fit 2 that point toward your hand. One is used to navigate back within a menu and the other is used to power the device on and off, as well as bring up the settings menu. Additionally, the power button can be programmed to execute a task (out of an assortment of options) with a double-click. I set it to open the music player controls, a function that I couldn't live without with the Microsoft Band 2. Attached to the Gear Fit 2 itself is the silicone band which, like the casing, comes in a variety of colors including black, ase an additional band to switch the style up. Though there is a pretty drastic shift in build materials used with the Gear Fit 2, it all comes together seamlessly in a visual sense. A little more eloquently than, say, the Microsoft Band 2. Flipped over, the heart rate monitor comes into view. 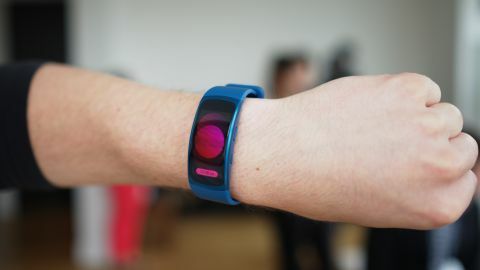 If you're into the nitty gritty of how this particular wrist-based heart rate tracking works, it's called photoplethysmography. Just like many other wearables, including the Apple Watch and Microsoft Band, the Gear Fit 2 uses infrared light blasters and green LEDs to track the rate of blood flow. One of the biggest design improvements over the original Gear Fit is the way in which it charges. We hate carrying more cables around than is absolutely necessary, so the fact that Samsung's 2014 wearable needed a proprietary connector was a bummer. Now, the Gear Fit 2 can gulp down electricity through its charging dock. It's still proprietary, but more forgiving because the dock allows you to rest it on any which way to get a charge. It takes zero effort to line up these pins and the screen activates in landscape mode to affirm that charging has begun. If a wearable isn't comfortable, there's very little motivation to put up with wearing it. Thankfully, the Gear Fit 2 feels sublime. The Gear Fit 2 fits onto your wrist in a similar "put the plug through the hole" manner to that of the original Gear Fit, but tacks on a strap loop to make sure things stay put during exercise. The means of ensuring comfort here are nothing new or out of the ordinary, but the silicone band just feels good to the touch. And, this might sound gross, but each day that I slept, showered and eked sweat into the band, the less I noticed it on my wrist.